Dana Gioia is an internationally acclaimed, award-winning poet. A California-native, his career started far away from poetry. For fifteen years he worked for General Foods as vice president of marketing before resigning to pursue a full-time career as a poet. Before this Gioia was still an avid poet with his work gaining fame in the 1980s. His first collection was Daily Horoscope, released in 1986. In 2002, his third collection, Interrogations at Noon, was released winning Gioia the American Book Award. 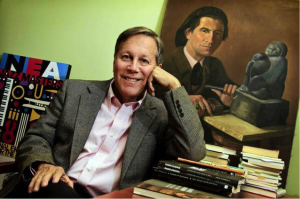 From 2003 to 2009 Dana Gioia served as National Endowment of the Arts chairman. In 2015 he was named Poet Laureate of California. His latest work is 99 Poems: New & Selected, was released this year. Throughout his career, Gioia has been classified as a “New Formalist,” writing in traditional forms. He has written over two dozen literary anthologies and college textbooks and has received 11 honorary doctorates.